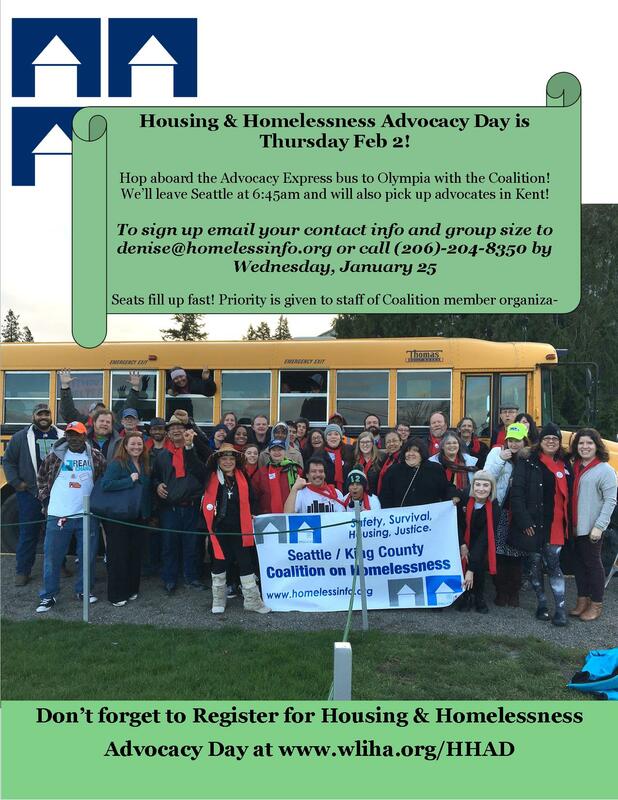 Housing & Homelessness Advocacy Express Bus for Feb. 2! Housing & Homelessness Advocacy Day 2017 is Thursday February 2nd! Ride down to Olympia in style on the Coalition’s Advocacy Express! We’ll have 70 seats total on two buses and priority registration for the bus is offered to Coalition members, staff, and clients/guests/members. Our voices are needed in Olympia now like never before! This is a “long” session year – the session officially started on Monday, January 9, and is scheduled to run through April (though very likely there will be at least one special session after). We want to have as many Coalition members and participants as possible sharing their real experiences with lawmakers in Olympia at HHAD. To sign up for a spot on the bus for you and others, email your contact info and group size to denise@homelessinfo.org or call (206)-204-8350 by Wednesday, January 25th! Seats fill up fast! Priority is given to staff of Coalition member organizations and individuals with personal experiences of homelessness. Click here for a PDF poster to share. Attending HHAD is a great opportunity for folks who have never been to Olympia before to join. We’ll share advocacy tips and what to expect on the bus, and the beginning of the day is full of workshops that can help people prepare. This will be a powerful experience whether it is your first advocacy day or if you’ve been too many times to count. Coalition staff, and friendly folks at HHAD will help make everyone’s experience as fantastic as possible!